With the New Year underway and the house being put back in order from the holidays, it’s time to reestablish home rhythms. This year is a little weird for me because I am in the final stretch of pregnancy, so as I am looking at our schedule and natural flow of the household, I am considering what rhythms are going to be conducive to daily life with a newborn, as well as with my other kiddos. Reestablishing rhythms after the holidays are important for us so that we all stay on track with home keeping, homeschooling and personal growth. There’s a lot happening in our family this coming year with another son transitioning into adulthood, another one entering his teens years and our littlest man growing up way too fast for my liking. My Lil Miss is about to become a big sister and she will be moving into a little more formal schooling throughout the year. Knowing I am going to have a newborn in the house again shortly has me considering a much more laid back, gentle, simplistic approach to our days. The first rhythm I want to reestablish is my personal devotional time. 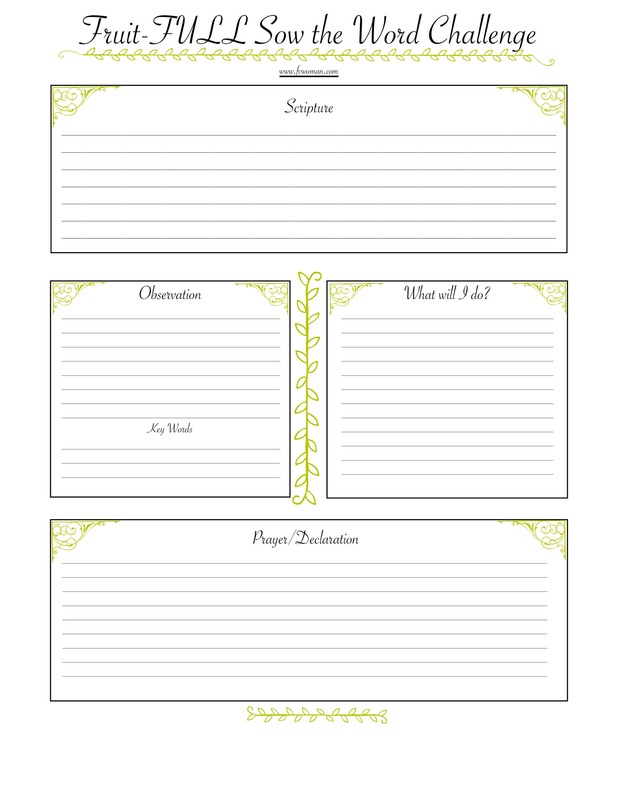 I know I am not going to have a lot of time to allot for uninterupted bible study and prayer, so I’ve made a worksheet that I can use in my daily readings that takes minimal time to fill out, yet helps me stay mindful of the Word of God. It’s based on the SOAP method, I can print several of them out at one time and keep a journal of what I am learning. I’ll probably put them in their own seperate binder. This year I am studying the Fruits of the Spirit. I’m also loading up on podcasts and audible books that I can listen to so that my soul continues to be nourished even if my hands are full. For my free printable, just click here or on the image above! The second rhythm I want to establish is Morning Time with the children. This is where we have our breakfast, our devotional, enjoy our read alouds together, and a few other subjects that we will be studying for this term. Morning time has been the key to our success in implementing a Charlotte Mason education. I also cover the younger kiddos lessons during this time after the olders are released to go do their independent work. We used to do chores before morning time, but for this season, I am going to schedule chores for later in the day so that we can put this first. Which brings me to our next rhythm: Chore Time. I have a pretty specific chore and housekeeping system for our household, my main concern is that I do not know yet what the new baby’s schedule will be. This will diectly affect my energy levels. My goal right now is to establish, at least, the kids in their routines so that they will be able to do chore time without much overseeing from me. The tricky part will be when we are able to start our chores for the day because I have no idea what time we will be waking up or what the baby’s nursing schedule will be. If I am sleep-deprived, I am no good, so we may have days that start a little later than usual. Our evening routines will probably become very important for this though, to ensure the house is in order every night before bed so that we don’t have as much to do during the day. My hope also is that all the decluttering and nesting I’ve been doing these past 6 months will prove to make things a little easier too. Next, Meal Prep and Planning. I almost have my 6-week plan in place and I’ve tried to include as many freezer meals as possible. I’ve already been stocking my freezer and scheduling specific meal prep days to make sure we have freeze ahead meals ready to go. I make and freeze meals for breakfast, lunch and dinner. This is a tremendous help for me during the day when we are in our homeschooling schedule. Making sure I schedule one or two days a week where I can bake and assemble meals is key to being consistent with this, and I know for me, it is always worth it. I’m also working on ordering our groceries online for pick up or delivery so that I won’t have to spend all that extra time fighting the lines at the store. Finally, a simple self care rhythm. It may sound silly, but drinking enough water, taking supplements, a little exercise, a shower and some moisturizer can go a LONG way for one’s overall mood and physical well-being. In this upcoming season, I know how important it is to take care of myself to avoid burnout. I plan on asking my husband to help hold me accountable to take care of myself so that I continue to nourish myself from the inside out and be the best I can be for my family. So, that’s how we are reestablishing our home rhythms this month after a very busy holiday season! We also had a SLEW of dental and doctor appointments to get through before the New Year and though it was necessary, I sure am glad that our appointment schedule will be scaling back now. I’m looking forward to settling in with Lil Miss 2 and the rest of the family for a year of home, moving forward in some much needed areas of life and cultivating fruitfulness. What rhythms are essential to the well-being of your home life and personal growth? « For the greater good… when everything gets put on “hold”.